This Google Map mashup of downtown Fredericksburg, VA allows anyone to create their own sightseeing map of selected attractions, monuments, shops, bars and restaurants. Also you can check out a tutorial illustrator cc of World vector maps free. 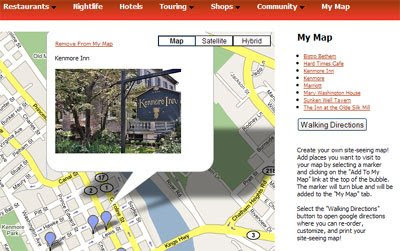 It can even provide you with walking directions for your tour. Whilst viewing a category, if you come across somewhere you would like to visit, you can click the ‘Add to My Map’ link and the location is added to your personal sightseeing map. When you have finished adding places you would like to visit on your tour of Fredericksburg just press the ‘Walking Directions’ button and you are presented with your own personal walking tour of the town.